You didn’t know me all those years ago at 22—but you would have known I would be coming one day. I’ve been thinking a lot about you. This is a momentous anniversary of something now gone, and so I’ve been thinking about you more than usual in the last couple of days. Today is your wedding day–April 1st. You can’t even imagine what course your life will take—where you are now is something you couldn’t have imagined back then. Your dress is lovely—the puffed sleeves are incredibly puffy—and your big hair is beautiful. The spiral perm that was all the rage when you were married created endless curls—and carpel tunnel syndrome for your hairstylist. I remember how pretty you felt that day. You looked at him with deep love, and look forward to your future life together. It’s beautiful to remember. You know that part of “the package” of marrying this man is that you don’t know where his work will take the two of you. You do know that you will move to Saskatoon now, and eventually California for graduate studies and then somewhere–anywhere–in North America. That’s a huge deal for you. I know how much courage that took for you—and I still admire you for it. You are stepping out into uncertainty, knowing that your love creates a confidence that outsizes the vulnerability. And the love you have for him outweighs the uncertainty of the future. You may not know where you live, but you know who you will live it with. Or so you thought, anyway. In a beautiful turn of events, you will land back in Winnipeg where you grew up. That will be familiar and wonderful. But in a painfully unexpected fashion, your heart will be broken. One day he will tell you that the life journey he is on is incompatible with being married to you. And he will pull out of the carport one Saturday afternoon after lunch and he will never come back. He will tell you terrible things about who you are and what you’ve done–it won’t fit with how the two of you have always been. You will be thrown into internal chaos as he relates to you like you are a monster–even though you haven’t changed from the way you were in the good years. You will be thrown off by his perception of you, which is so very different than who you know yourself to be. You won’t know who you really are again for a very long time. It is still gruelling for me to recall how very, very brutal that is on you. The sleepless nights, the hours of keening wails with a friends who can only rub your back while you sob, the weight loss, the physical pain that comes with wondering if the emotional pain might actually drive you mad, the terror about how to move forward in life. But that’s not for years. After today, your wedding, you are heading into many years of wonderful. Those years in California with no family mean you lean only on each other and you discover connection and strength between the two of you. You will have adventures at the ocean and in the woods and in San Francisco and Los Angeles that will be fantastic memories. You will together bring two of the liveliest boys into the world that will delight you. Those boys will be the light of your life and the two of you will enjoy their antics and their joy endlessly. Those years of raising toddlers will be full. You don’t know it yet, but you will start a master’s program! When you have preschoolers and you are studying for your therapy degree, you will be tired and stressed. You won’t read any novels or watch much television—your late night feeds will happen with text books in front of you, and nap times will be when you will write papers. You will be grumpy and complain about how hard life is. That was a powerful turning point, where you quit your bellyaching and go for it. You will pick to finish your degree and he will bless you by doing childcare as you go to the library to research and write and learn, he will do extra laundry and washing dishes so you can sit at your computer. And you will graduate to become a marriage and family therapist. His support and love will come to mean so much, you will wonder who you are without him. So much of who you are will be about supporting him in his ministry, helping him behind the scenes, doing what you can to make his life better—and being appreciated for it. You will love your life and be lost when it falls apart. 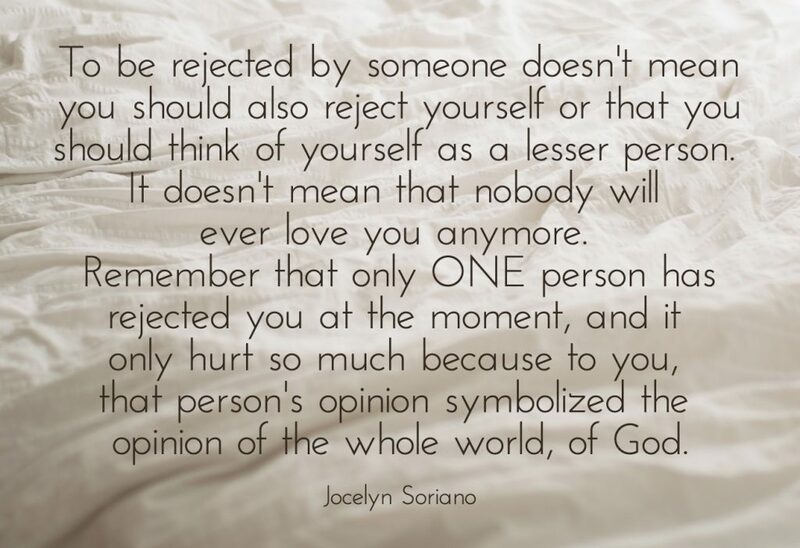 When he stops loving you, you will wonder if you are lovable at all. It’ll be a knock down, drag’em out fight within yourself to figure out who you are without him. It will take a while, but you will come to know that you are a valuable human being, just as you are. You will wrestle with the stories you tell yourself. And your friends and family and the healing journeys of your clients will help you come out the other side. You will know the truth of who you are. Your clients, the ones in the muck of marital struggle, will be the ones to remind you that marriage is good, that it is still worth believing in and fighting for. It will be hard and beautiful to see the vulnerability, courage, and connection of husbands and wives to each other in your office. Your clients will inspire you believe in marriage, even as yours ends. 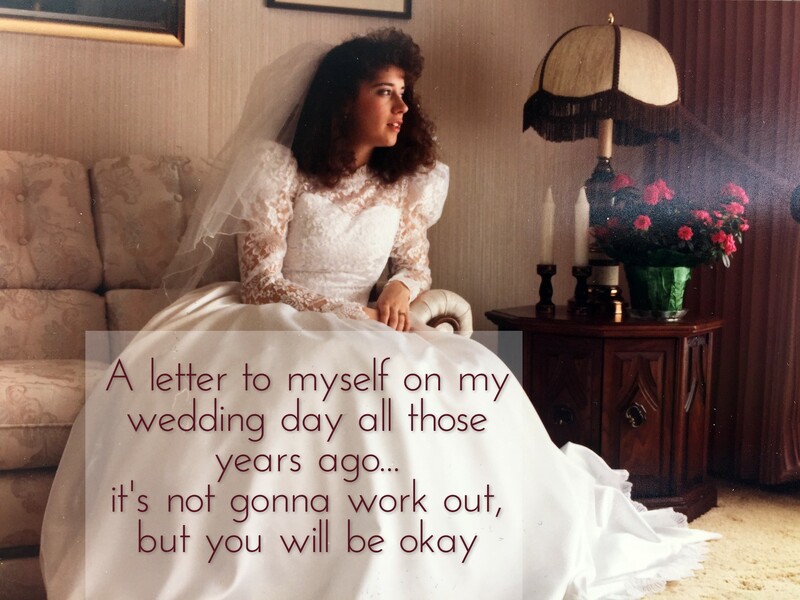 I’m so proud of you today, on your wedding day, as I remember this now on the anniversary. I’m tickled, not only for your courage to start this unfamiliar adventure, but for your willingness to embrace the unknown. You are choosing love over fear, and adventure over safety. I’m excited for you because this journey will take sharp twists and turns. Though it will be wicked challenging—you will make it. And be stronger for it. Sometimes, when people get divorced, there’s a lot of “woulda/coulda/shoulda”—where people regret the decision to marry at all. I used to question you. I have judged you in years past, thinking you should have known better. I wanted to have asked more questions, been more careful—to not marry this man, to not ever have to become divorced. But that wasn’t fair to you. You made the best decision with what information you had at the time. You went into this marriage trusting him. That’s gutsy. Looking back, it is far better to have trusted and lived life full, even though it exposed you to a broken heart. Loving anybody is a risk. There are no guarantees in life, and I’ve no right to fault you for marrying him. You are starry eyed today. Enjoy the day. I’m so glad you don’t yet know how hard it will get. Embrace the beauty of today. Really, none of us know what will happen tomorrow. What we can all do is celebrate the fun of the day as a way to build a reservoir within ourselves for the inevitable rough days ahead. I’ve often remembered how much you loved that day, and how good it was to build your good life with the man you married all those years ago. Sometimes, I felt the pull to hate the day and every day after that, when it went bad. So often, when the ending is bad, our world tells us we have to hate every moment. Even those that were once good. That’s not fair or kind or realistic. Out of that marriage will come the two most beautiful miracles that you will have the privilege to raise. They will give you life when it feels like yours is over. They will become interesting people that have wonderful friends and that are going on to change the world. You became stronger when being married to him meant being stretched, exploring new parts of yourself, getting to know the world. There were many years he was good to you, and good for you. That can still matter. It’s ok to value the good parts of something that went bad. Younger-version-of-me, I will work to always remember you on your wedding day and during the good years fondly. I remember how much you were looking forward to a great life with the man you married all those years ago…and how you enjoyed growing up into a full adult with him. And that memory stuck with me. I promised you that I wouldn’t remarry unless I was confident that a second marriage could be even better than the good years of the first. That was a tall ask. Hang on tight, Carolyn, it’s gonna be a wild ride. It’s gonna be full of fun and adversity, adventure and new experiences, love and heartbreak, sticky handprints and zerbit kisses, lots of hard bleachers and soft tissues, growth and joy. It won’t be at all what you are expecting, and at times you will be bent almost to breaking—but you’ll make it, girl. You will make it. 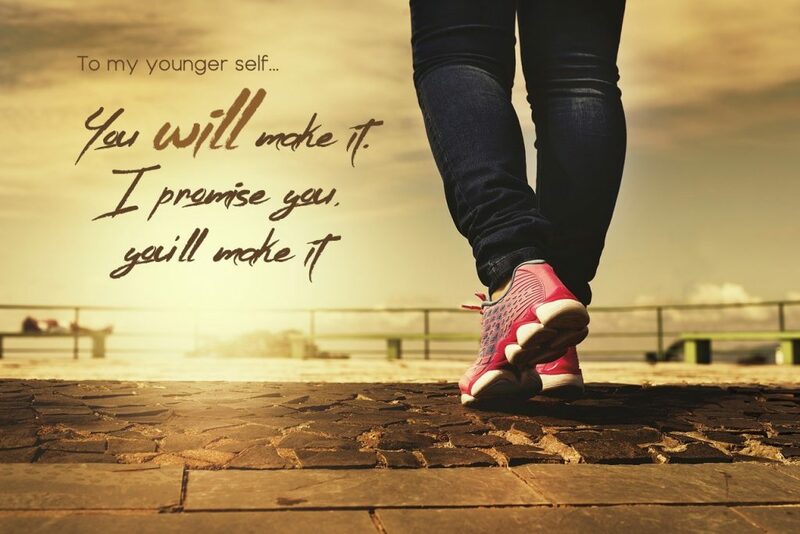 I promise you, you will make it. Carolyn, the one I am 30 years later…today. “In the meantime I keep working on me”…no more inspiring words have ever been spoken. I think that’s something we are all called to do…and trust that this is enough. Blessings and joy on your journey forward, Shauna!